Walmart has released its Black Friday flyer, and its chock full of great deals for gamers. 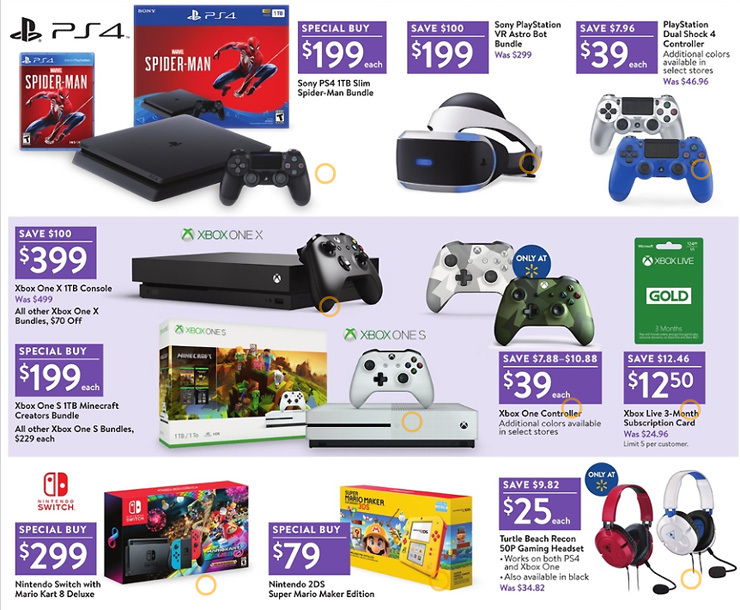 As we previously reported, multiple retailers, including Target, will be selling a Spider-Man 1TB PS4 bundle for only $200 this Black Friday, but Walmart will also be offering a Minecraft 1TB Xbox One S bundle for $200. Nice! Other hardware deals being offered by Walmart include a Mario Kart 8 Deluxe Nintendo Switch bundle for $300, an Astro Bot PSVR bundle for $200, a Mario Maker 2DS bundle for $80, and an Xbox One X for $400. You can also grab yourself an HP Pavilion 15-inch gaming laptop with a NVIDIA GeForce GTX 1050 Ti graphics for only $600. Again, nice! God of War for only 25 bones is definitely an enticing offer, and it’s rare to see so many Nintendo games including in these kind of sales. Black Friday kicks off the day after Thanksgiving on November 23, but Walmart will be opening its doors at 6pm on the 22nd. You’ll also be able to grab some deals online on Wednesday the 21st. Some retailers are offering deals even earlier, so keep an eye out! Want to do a bit of comparison shopping before you brave the crowds? Here are Target and Best Buy’s Black Friday deals. For the Americans out there, are you planning to pick up anything on Black Friday? Or are you avoiding the madness/waiting for those Cyber Monday sales?